As you're driving from Melbourne towards Warburton, you might notice your health being toasted by a Father Christmas-like gent by the side of the road. Out the front of the Sam Knott Hotel in Wesburn there's a wood sculpture of an icon that decorated Australia's pool rooms and pub for just over a century. The subject of the sculpture is Sam Knott, a prospector who came from England in 1888 just as Victoria's gold rush had run dry. Sam found work other work including in the pub that now bears his name. The current bartender reckons he was repeatedly paid the same pound note once a week that he religiously returned to cash register to clear off his weekly drinking slate. In 1906 a photographer from the city snapped the enthusiatic drinker at the bar. When he remarked that he enjoyed his drink even though it was before noon, Sam cracked his famous line "I allus has wan at eleven" which became part of boozing and branding history. 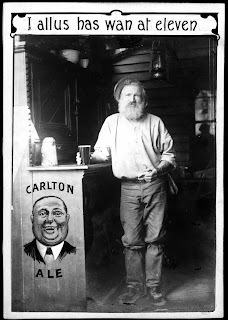 Carlton United Breweries loved the image it accompanying story - promptly putting Sam's mug and slogan onto posters that still hang in Victoria's pubs today. I allus have eleven at one. As poetic as Sam may have been, it's unlikely he came up with a verse mid-drink. Still his legend lives on. Some speculate that he was really Sam Griffin and was renamed by the brewery. A story they tell around the bar at the Sam Knott hotel reckons that Sam's thirst was supernatural. When Sam died they brought his coffin into the hotel and propped it up against the bar for one last drink. They say that even as they lay the body in the ground Sam rose up again to for another drink. And some say it still happens with a shadowy figure leaning against the bar. Usually around eleven. Image courtesy of National Archives of Australia's Virtual Reading Room. That's at Wesburn! bravo. I thought that name was familiar. Have bought a bottle there once, though not before eleven (pun unintended). I get a bit confused about it all, but I think - but not sure - the road ended somewhere around there until later they blasted out a road along the edge of the river, which is now the curving bit of road into modern Warburton. Old Warburton (nothing left to see, as far as I can make out) is up on the hill behind Wesburn. Thanks for the eagle-eyes, parlance & genevieve. If we could afford prizes here at Hackpacker Nerve Centre, you'd both be given something shiny and impressive. It'll have to be *virtual*. I am *virtually* astonished at the depth of parlance's knowledge of the district. Verily I speak as an eastern 'burbs tourist. Old Warburton sounds like it could have a story to tell. And I meant to say, Sam Knott's story is great to hear too. Genevieve, I had a *virtual" red face at the compliment. I'd better admit an interest in the matter - I have a house at East Warburton.